Kings and Legends (KaL) is a tactical trading card, turn-based strategy game. You are the lord of Silver Heron Ridge. Together with your hero, your town and your deck of cards explore the land in the main campaign, party up with your friends for challenges or pick up the competition with other players in the arena, there's game play for all. The town is where the player's adventure begins. There are several key buildings to build, unlocked as you gain levels. Starting off with the City Hall where players can tax the town for Silver and Crystals. Upgrades of buildings brings about different benefits. 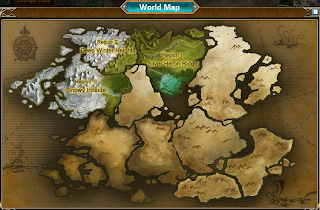 Resources are limited, it's up to the players to decide which buildings are key to their strategy. There are 4 classes (warrior, ranger, mage, priest) to choose from at level 10. 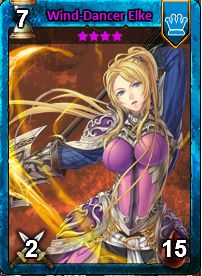 Class choice will affect the type of cards you may want to use in battle. Would you like to be the warrior who rallies his troops to enhance their damage or the mage that strikes and affect the battle field with his spells? Equip your hero with upgradable weapons in the Blacksmith as these will be crucial to how well you fare. Cards can be purchased in packs from the shop, bought from the auction house or found through battles during the main campaign. There are 7 creature races of cards and very action during the battle is dependent on them. They are ranked differently and have 3 major stats, attack, health and cool down. Special abilities can be appear on card, abilities such as Cure (heals most damaged played creature in battle) or Viglance (allows unit to attack neighbouring positions). 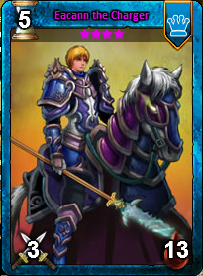 Other than creature cards, there are class specific skill cards that are utilized by your hero to buff, damage or affect the battle field directly. Players with competitive streak can compete in 1v1, 2v2 or even 4v4 modes in the arena. Play against other players, play with friends, play with guild mates, it's all up to the players. There are ranked PvP games that affects the ranking of players. Ranked players are rewarded for their efforts at the end of the season. For those who prefer a more cooperative nature, they can party up with friends to take part in challenges and boss fights. There are several events, daily activities for completion making every minute in the game exciting and fulfilling. Band together with your friends to create a guild, additional boosts can be added to your town buildings with guild research. Together or alone, may you be King or Legend . What are you waiting for? Pick up your deck and join us in Kings and Legends on Viwawa!